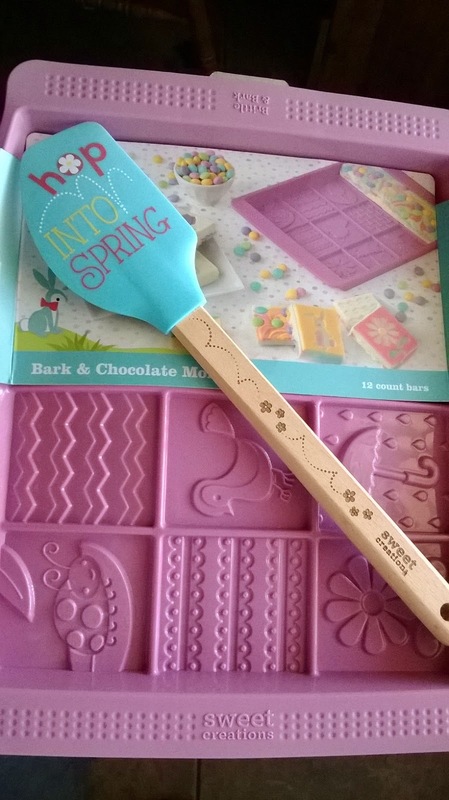 As a part of the Good Cook Kitchen Experts Program, I recently received a Sweet Creations Mold from along with an adorable spatula which says Hop into Spring. It took me all of about 1 minute to figure out what I was going to make..Homemade Peanut Butter Bars! I think I ate about 20 lbs of Reese's Peanut Butter Cups when I was pregnant with my boys. I had such a hard time keeping food down..but that was one thing that always stuck! I really love that I got to try making my own homemade version (which was MUCH cheaper than the store bought) and the kids said they were way better too! This recipe was really super easy. First, you melt the first bag of chocolate chips in a microwave safe bowl for about 30 seconds, stir, 30 seconds more and then you should be able to stir until smooth..poor quickly into the Sweet Creations mold and let sit for about 10 minutes or until firm. While that sits, on low speed in a mixer, combine the peanut butter and the powdered sugar until smooth and creamy. Spoon evenly over the chocolate. Finally, repeat the melting process on the 1nd bag of chocolate chips and spread that over the layer of peanut butter. I let mine harden in the refrigerator for about 3 hours before breaking apart.